After a split-second blink because of the very loud noise, I opened my eyes to a windshield that, though still intact, had splintered into a thousand shards of glass. My rear view mirror was cracked down the middle, the passenger side mirror was hanging off the side with the mirror part gone. Glass dust was all over the dashboard and front seats. “What just happened?” all three of us asked nearly simultaneously. The young one started crying. The older one started crying but stopped rather quickly. I had to keep driving because there was nowhere to pull over and stop at that moment. I spoke soothingly to the young one, but it was to no avail. We were about three miles from home so I kept driving. I remained as cool as a cucumber until I pulled into our driveway and got out of the car. When I got into the house, I had to sit for a little bit and just let my body shake the shakes out. We never did see what hit us. All evidence points to a rather large branch from one of the overhanging trees. It hit on the roof of the car about an inch above the windshield right above the driver’s side. 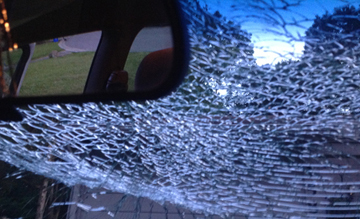 When I saw how close it came to crashing through our windshield, I stared in wide-eye wonder of what could have been. Ever have a BOOM! moment in life? Your perspective gets a little smashed and you can’t see clearly? Yeah, me too, a little too often. Then there was news on Facebook that my cousin’s almost 5-month old grandson’s liver has shut down. He will need a liver transplant or a miracle very soon. He’s too small to be going through so much. And a few minutes ago I got off the phone with a mom of one of my daughter’s classmates at her former school. She called to let me know that one of the fifth grade boys had died during recess the other day. After he collapsed, one of the teachers started CPR, but he never revived. This boy and my daughter haven’t seen each other since she changed schools, but he was a friend of hers at one time. I’m sorry, I have no great pearls of wisdom to share, just sorrow right now. I don’t even know what or how to pray at the moment. I mean, if I’m feeling overwhelmed, how are the people who are going through it feeling? What should I ask, Lord, when my heart aches so much? The words aren’t there. Some weeks the booms never stop coming. The blitzkrieg is on. If not a direct hit, the explosion is often close enough to make standing up from day-to-day difficult. It’s deafening. Our vision can become blurred with tears. But somehow we have to keep going—to help, to support, to pray, to keep living. Our time to collapse will come, but not now, not yet. I have been taught and still steadfastly believe that one day our tears will end. Lord, help us through to that day.